Because 2016 is the year that we've all collectively decided we look better with dog noses covering our faces and flower crowns floating around our heads, one brand decided to re-create our favorite Snapchat filters IRL and call it #fashion. At their runway show during New York Fashion Week on Thursday, Desigual created beauty looks using Snapchat Filters. 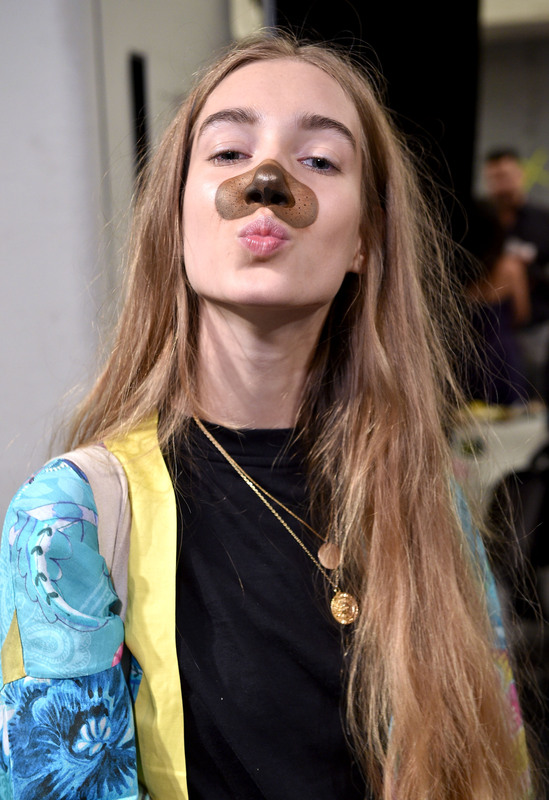 A number of filter-inspired looks came out of the iPhone screen and down the runway, including the bumble bee, the fawn, the angel-with-gold-things-around-her-head, the flower crown and of course, the puppy dog face. Well hello, halloween beauty tutorial inspiration. Sadly absent were the old man filter and the filter that makes it look like you're throwing up a rainbow when you open your mouth, but I suppose the line of what constitutes #fashion sadly had to be drawn somewhere. Better luck next season, I guess. These oh-so-millennial makeup looks were created by a team from MAC Cosmetics. Because of their intense colors and the fact that they were literally made to hover over your face, the digital "masks" translated nicely into makeup. Apparently, all you need is a little bronzer and a steady hand and you can turn yourself into a real-life woodland creature! The models wore a number of different hairstyles with their Snapchat makeup including loose waves, a stick-straight pixie cut and tight curls. The actual clothing in the collection was inspired by the "Global Traveller," and featured bright colored clothing in cuts that the designer described as "comfortable while hugging the body’s curves.” There were 48 looks, and they ranged from embroidered denim and bomber jackets to military-inspired rompers. Apparently, anything goes style-wise when you're a walking angel with butterflies floating around your head. The nail art at the show was also social media friendly, and embraced metallic shades that are basically every Instagrammer's dream. It's no secret that social media is changing the face of fashion week as we know it — from more and more designers embracing the "show now, buy now" model to influencers replacing editors in front row seats – and brands are being forced to find new, innovative ways to adapt their to fashion week. Desigual's approach was overwhelmingly meta, as it both embraced and poked fun at the "Content Monsters" inevitably seated in the front row. Obviously, people were going to be non-stop snap chatting the show (that is, after all, the way the world works these days) so why not just provide the filters for them? Say what you will about Snapchat filters (and trust me, people have been saying a lot over the last few months) but one thing is for sure: These beauty looks are not only adorable, their unique, which is always a positive during show season.